We visited Alibaug last month , me and hubby minus the little one who opted to stay put with grandparents. It was a much needed break after ages and we ended up finding a real nice place to stay. taste. It reminded me of the small mango pickle that I made last year. I wanted to make it again but with a different recipe this time. My greed for mangoes kept increasing as I started plucking them.After plucking about 2 dozen of them and still not satisfied I asked hubby to help me with picking more , especially the one's out of reach. Bewildered & embarrassed he went straight to the reception and told the manager to charge the amount to our bill. The manager reassured him that it is only natural temptation and that we were not the first one's doing so...I came back happily with the kitty and made this pickle very next day. 2) Roast the fenugreek seeds in a tspn of oil. 5) Heat the oil till smoking point. 7) Mix the oil and the mustard seeds powder and add this stuffing to the mangoes. 8) Place the mangoes inside a large sterilized jar. 10) The pickle will be ready to eat after 3 days. Seriously am missing this baby mangoes, wish i live in India rite now, thats a droolworthy pickle,cant stop drooling here myself. love the way the coriander seeds stick to the mango pieces. So totally love the looks of this one Pradnya! wud just love to have one of them right from the screen. 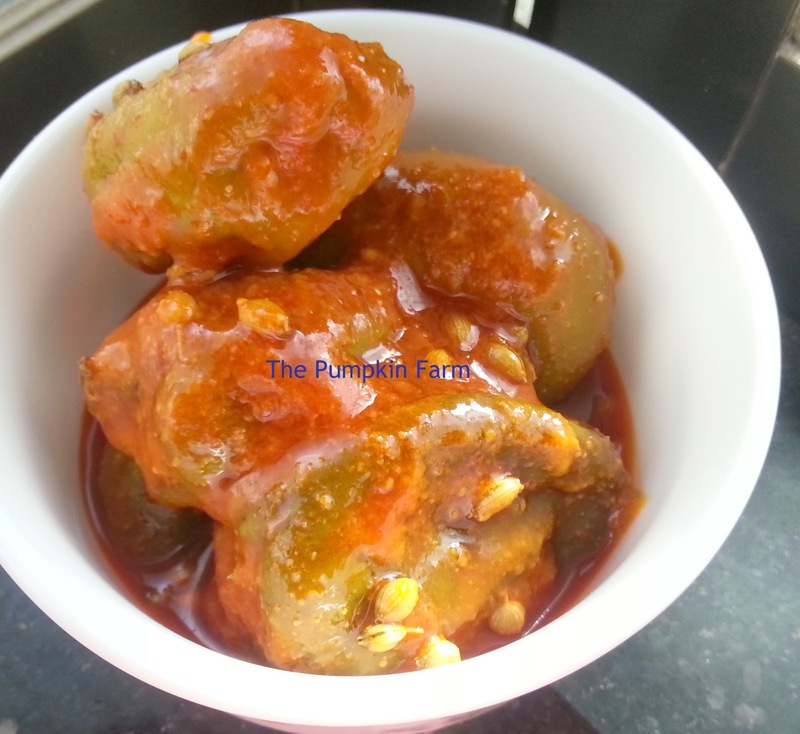 Your pics are great Pradnya and the pickle has me salivating. Love it. My husband is sure to love it! That pickle is looking finger licking good. Wow I love those tiny mangoes..and a pickle will surely be yummy! Love this baby mangoes, good summer pickle.